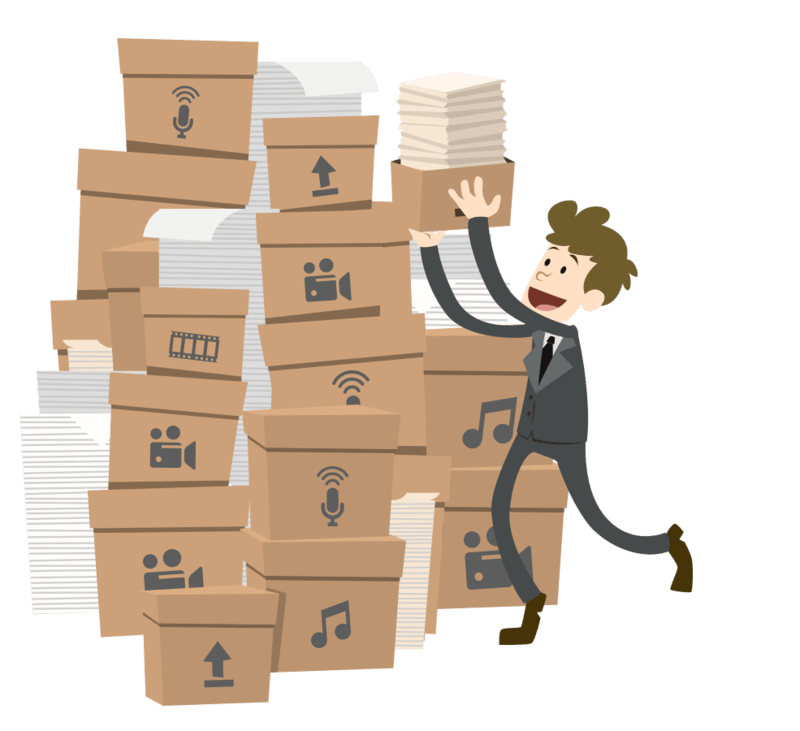 This is the first chapter in our Content Stacking series, all about producing prolific levels of content. In this series, I want to show you how to make regular content easier, while still keeping the quality sky-high. It means squeezing the most juice possible from every single content idea you have. You do that by putting just a bit more thought into how to plan, produce and publish. Interested? Alrighty, let’s have a look at Content Stacking. Podcasting is what I do. It’s the medium I love, both to consume and to create. I work every day with people who are starting shows, improving their content, growing an audience and moulding fans. That’s the goal, in the end: creating fans. Of your brand. Of your product. Of YOU. Podcasting is still, for me, the most effective way to create fans. I’ll go through the options to show you why. Text is great to begin with. It’s low barrier, high reach, completely ubiquitous. It can deliver quick value hits as easily as long, deep explorations of your subject. It should always be part of your content mix and forms the front line of your awareness efforts. But… when it comes to building rapport, and deeper relationships, it can’t quite compete with rich media. Media can captivate through personality, values, and honesty, all of which are delivered in spades when we see or hear someone speak. Video and audio show the real you, creating a personal connection that only the best writers can replicate. But, video has one weakness; the goldfish brain. Time and again, stats show the ideal video length is sub-5 minutes. It’s a weakness that the written word shares, resulting in a generation of skim-readers. The reason is simple, both text and video are asking for one of the most valuable things we can offer: our time. And, not only our time, but our attention. Our full attention, for as long as it takes. It turns out that our attention is precious, and we’ll not give it for long without damn good reason. Enter the Podcast. The podcast is less selfish, more easy-going. It’s not looking for our full attention, just a smidge will do. You can listen in those moments when you’re performing by habit, like driving to work, walking the dog, or cooking your dinner. It turns out, by being a little less selfish, the Podcast attention span skyrockets. Some of the most popular shows in the world run for an hour or more, and still generate millions of listeners. At the extreme end of the scale, Dan Carlin commands 6 figure audiences, keeping listeners entranced for up to 3 hours an episode, entirely solo! So, video and podcasting allow your audience to know you, putting out the real you. Both have a real power to create that connection. But, Podcasting, through this massive attention, has the capability to do this on a huge scale, engaging listeners perhaps for hours at a time. That’s what creates a personal connection, generates trust and starts to nurture fanatical fans. And that’s why I think everyone should have a podcast. Simple: Let’s Go “All-In” on Podcasting. No? As much as I’d like to say it, Podcasting isn’t a panacea. I’m the first to admit it works most effectively alongside it’s media siblings: text and video. There’s more than one reason for this, but the big one is that which we all crave and fear in equal measure. Google search. When it comes to search, Podcasting doesn’t have a big enough mouth. Strange, given that there’s are no shortage of big-mouths stinking up the digital airwaves. But, here we’re talking the mouth of your funnel. Your sales funnel, to be exact. A sales funnel is so-called because your sales process is shaped like a funnel. 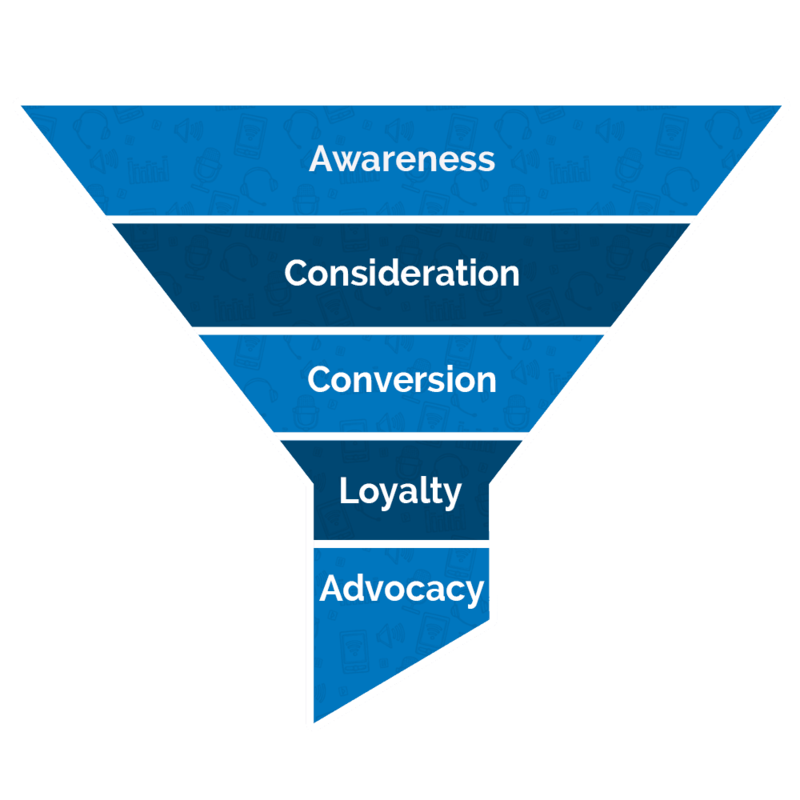 You put ‘leads’ in the top of the funnel. It’s widest there – that’s the size of your mouth, or the number of people in that point of the funnel – because it’s the first contact people have with you. At this point there’s no commitment, so you get lots of people (leads, if we’re being mercenary about it) dropping in for a look. That might just be a simple search visitor, at the very top of the funnel. Go down the funnel, though, and people are making more commitment: they decide to read another article, watch a video, subscribe to your email course, buy a product. As this happens, they move from awareness, to consideration to conversion. That might be a purchase, or subscribing to your email list. Then your content continues to move people through the funnel to loyalty and advocacy. As you move through this process – down the funnel – you whittle down the number of people, because a few prospects drop out at each stage. That’s why it’s a ‘funnel’ – it gets narrower as you work your way down. One aim of your business is to maximise the ‘mouth’ of your funnel, by which I mean the number of people entering it at the top(quality matters too, but we’re taking relevant, good quality content as a given). And one way of maximising that ‘mouth’, is simply to attract more traffic to your content. That’s where Podcasting needs help. The public can make first contact with you via your Podcast, but iTunes search traffic is minute compared to Google or YouTube. Google has the biggest mouth there is, and YouTube is not far behind. 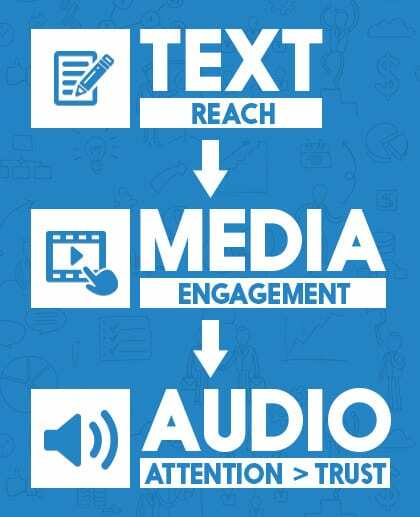 That means you need text to maximise your reach, video to supplement it and then podcasting to create your fans. Here’s how that works. So, we have ‘leads’ in the top of the funnel, attracting as many people as we can through a mix of text, video and audio. What next? How do we then turn them into these fabled fanatical fans? That’s where the content stack comes in. Basic principles: the public types a question into Google, you write a blog post to answer it. That’s the biggest reach you have: text search. Next, you raise the likability, the credibility, the trust by introducing personality. We talked already about how both video and podcasting are great for this, but video has the reach advantage. The audience is huge for video search, and it’s so quick and easy to watch a few good video clips. Search, watch, search, watch. Simple, no tech involved. That’s great – it shows people who you are, and encourages them to make a bigger commitment, which is to listen to your podcast. Podcasting is where you build a really personal connection, absolutely maximising that trust. It includes the personality – same as video – but I talked already about the force multiplier: attention. Every minute they listen to your show, you’re nurturing their trust, and because you have them for so long each week, you’re doing it fast! Not to repeat myself… well, actually, to repeat myself entirely, that’s what creates fanatical fans, and that’s what makes it worth guiding them through to a podcast. So, Write, Film AND Record….? Yes. Do it all. That’s how you’re going to create fanatical fans, stand out in your market and beat your competitors. How? It doesn’t look easy, does it? That’s the next step. That’s the core of content stacking. I’ve been working on ways to break it down, to systematise it and to output prolific levels of content, all while still doing your real job and retaining creativity. That’s the model I’ll cover in the rest of this series. The key here is finding that model that makes sure you get the maximum you can out of every bit of content you produce. Not to mention planning it so that every bit of content works together, drawing people through the mediums. 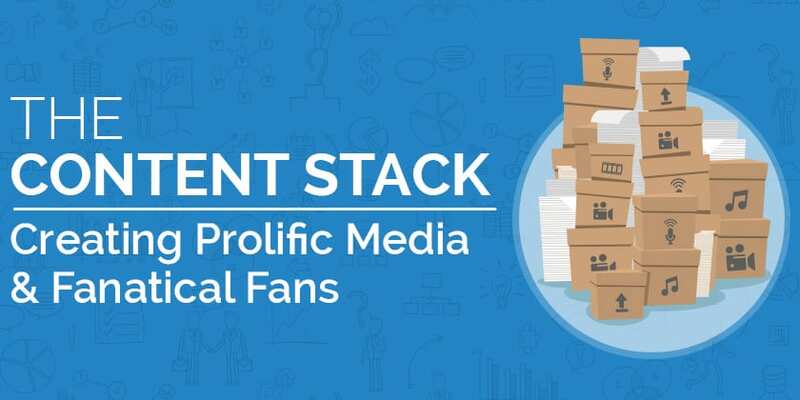 Everything they consume stacks up in front of them, and every block of media in that stack is another chunk of engagement with your brand. Once they’ve stacked up enough views, enough reads, enough listens, that’s when they become fans. And that’s when they buy with you, and promote you to their friends. I hope that’s given a good picture of what we’re looking to achieve here. If you’re up for it, for building your own stack, let’s dig in! BRILLIANT blog, Colin! I absolutely adore how simple you have made this. You’re so much more than a Podcast Guy! You are the Content Proliferation Guy. I’ll try to keep the rest of the series just as clear, once we get into the how-to! Great article. I’m just about to start my podcast and needed a good overview, I’ll definitely read all the other chapters too. Thank you! Stumbled onto this site and wow, it is just the content I was looking for! If you have the time and inclination, do check out http://deeper-still.com; your comments/feedback would be greatly appreciated and valued!